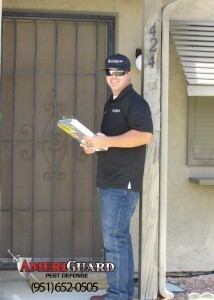 Call AmeriGuard today for a professional termite inspection by a experienced and licensed inspector for free limited inspection or a nominal $89 fee for a full inspection, which will be waived if AmeriGuard is contracted to perform structural fumigations, secondary local “spot” treatments and wood repair on the structure. In addition to quality termite control, AmeriGuard’s wood repair team will expedite any repairs during treatment, ensuring a smooth transition of your property. AmeriGuard’s comprehensive wood destroying pests and organism (WDO) inspection reports cover all sections of termite activity. Our State filed reports are accepted by all private and government institutions. We will provide an emailed official PDF report to all involved parties. Section 1 – All visible infestations or infections present at the time of the termite escrow inspection. Section 2 – Conditions that are present deemed conducive to a future termite infestation or infection (moisture, faulty grade, earth-wood contact). Upon completion of the termite inspection, AmeriGuard will e-mail, fax or mail the report to the authorized party responsible for the wood destroying pests and organism inspection report. At your request, we can expedite this process to within 24 hours of the property’s inspection. Our licensed termite inspector will inspect the property, advising of all Primary and Secondary recommendations. After the property has been inspected and corrected, a Completion Report of the property will be issued. AmeriGuard can perform your licensed VA Wood Destroying Insect Inspection Report is usually required for VA loans and refinances. This form, commonly referred to as Form npma-33, is requested by the VA when processing a home loan or refinancing. We are proud to provide for all you veterans out in our community. Your AmeriGuard Wood Destroying Insect Inspection Report will include a visual inspection of the readily accessible areas of the structure. The inspection will include all wood destroying insects, including drywood and subterranean termites as well as any fungus or dryrot. There is a nominal $89 inspection fee for this report which can be paid with cash, check, or any major credit card. Note: All inspection fees are applied toward the cost of any related work performed by us for the original findings. Inspection fee is due at the time of inspection. Most reports can be typed and emailed you and your lender within 24 hours of the inspection. If you have another inspection report and wish for a second opinion, we welcome you to e-mail, fax or mail the report to us. We will schedule a convenient inspection time to inspect the property. We understand termite infestations and any related damage/repair work can be costly, and we recommend finding the best value for you dollar. Second opinions performed by AmeriGuard Pest Defense has saved homeowners thousands of dollars throughout the years.Call 951-652-0505 today. Have you encountered piles of sawdust, small holes in wood members, mud tubes leading to your property or have been inundated by clouds of winged termites? These are all signs that you have a termite infestation! AmeriGuard will send a termite inspector to examine these areas of infestation free of charge. However, AmeriGuard always recommends that you have a full termite inspection preformed for a nominal fee. AmeriGuard Pest Defense is your one step wood destroying organisms solution. For just $89, we will perform a full inspection of any property. Should you decide to choose AmeriGuard as your fumigation, termite treatment or wood repair provider, we will wave our inspection fee. We offer competitive pricing on all of our termite treatments and fumigation. In addition, we can restore any home to its former beauty with our team of in-house, wood repair specialists. We confidently repair any damage and provide paint matching services with quick turn around.